TEGUCIGALPA — The campaign for the general elections on November 29 in Honduras officially began today and has been rejected by extensive social sectors opposed to the military coup that took place last June 28. In a communiqué released prior to the start of the campaign, the National Anti-Coup Front confirmed that staging elections without restoring constitutional order would be to legalize military violence against the state and, therefore, is unacceptable, PL reports. 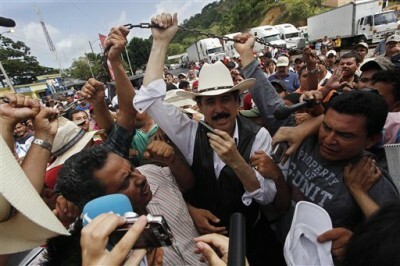 The Front has decided not to recognize the campaign, the process or the electoral results if democracy and Manuel Zelaya, the constitutional president, are not restored. A similar position has been adopted by independent presidential candidate Carlos Humberto Reyes, who called on all non-coup candidates at all levels to withdraw from the electoral process if the dictatorship is maintained. The Democratic Unification Party – that proposed Deputy César Ham – also stated that it will not participate in elections under the conditions of the military coup, in agreement with legislator Marvin Ponce. To date, the only presidential campaigns to have started are those of the two traditional parties: Elvin Santos, of the Liberal Party, and Porfirio Lobo, of the conservative National Party. The other two presidential candidates are Felícito Avila, of the small Christian Democrat Party, and Bernard Martínez from the Social Democratic Innovation and Unity Party, with a sector opposed to the de facto government. Meanwhile, the Front announced that it is to strengthen the structures of resistance to the most distant corners of the country in order to demand the restoration of the state of law. Israel Salinas, general secretary of the United Workers Federation, announced that for this purpose, a rally has been organized for next Sunday in the capital with representatives from all over the nation.